Being the “catch” of the town has a whole new meaning as Southwest Louisiana hosts the second largest Mardi Gras in Louisiana. From parades, galas, chicken runs and Zydeco, we make sure the whole family has something to celebrate. Here are the TOP 6 Mardi Gras events you do not want to miss! Click here to see all Mardi Gras Events! The excitement kicks off on January 6 with the annual Twelfth Night Celebration, as the 2016 royal courts of more than 60 krewes usher in the New Year in style with their extraordinary and intricate costumes. After Twelfth Night, Laissez les bons temps rouler, as the celebration and festivities pack the calendar until Fat Tuesday​. For a taste of Mardi Gras, sample from every pot at the World Famous Cajun Extravaganza and Gumbo Cook Off. 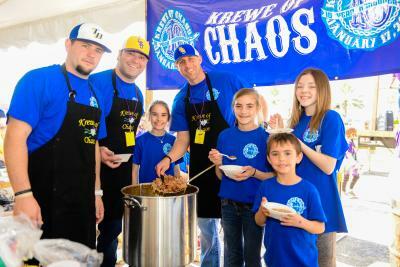 Amateur and professional teams will stir up hundreds of gallons of rich, spicy gumbo and serve it up, which is a Mardi Gras tradition among krewes in Southwest Louisiana. The event is a must-be-there mix of award winning food, floor-stomping music, and the down-home spirit of Mardi Gras. Mardi Gras in Southwest Louisiana prides itself on being family friend. Typical activities for Children’s Day include an education station, making Mardi Gras arts and crafts while learning about the traditions and history of the carnival season and more. Groups present cultural and historic experiences of Mardi Gras. Children have the opportunity to be photographed in a costume display sponsored by the Mardi Gras Museum of Imperial Calcasieu​. 15 parades of green, purple and gold will roll throughout Southwest Louisiana. Children&apos;s Parade, trail rides and the every popular Krewe of Barkus Parade - for your four-legged friends. Two new parades join the Cajun Carnival this season, Second Line Stroll; a walking parade, and Jeeps on Parade. Afterward, reserve your spot for the grand finale of Southwest Louisiana Mardi Gras, the Krewe of Krewes Parade featuring costumes, plenty of beads and elaborate floats winding through Lake Charles. Click here for a full list and details. Always a favorite, don’t miss the Royal Gala, as the 2017 royal courts of krewes parade for the public in full regalia. Both of these events are held at the Lake Charles Civic Center.